The ongoing war in Yemen has left ordinary people suffering. You can help them. CAFOD's partner on the ground is getting aid to those who need it most. Your donation could pay for food for mothers and babies suffering from malnutrition, clean water supplies, and sanitation for communities whose homes have been destroyed. What are the needs in Yemen? Yemen is one of the poorest countries in the Middle East, but since the civil war started in March 2015, ordinary people have suffered even more greatly. Fighting and a fuel blockade have meant that the economy is close to collapsing, public services such as hospitals are disappearing and most people have used any savings, so are surviving day to day. Water and food are hard to find and expensive. Shelter and sanitation are needed as homes have been destroyed, and many thousands of people are in need of medical attention - not just because of injuries from the war, but because they are suffering from malnutrition and disease. 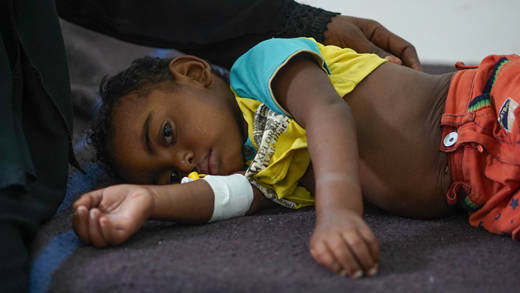 Rafi*, pictured, is one and half and has suffered with diarrhoea for a month. His mother Habiba said "The worst decision we have ever made in our life was leaving home. There we would be killed once, but here we are dying hundreds of times. We suffer homelessness and hunger, diseases are killing our children front of our eyes. We miss our home, we miss a more dignified life." 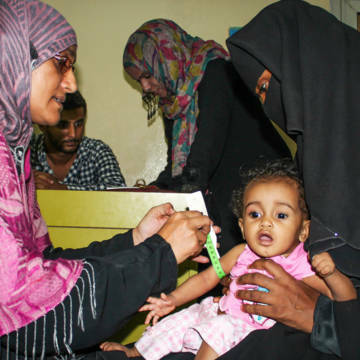 CAFOD have an expert partner on the ground in Yemen. We have to keep their name confidential for security reasons - but they are getting aid to people most in need. Their work, that you can support, includes nutrition for mums and babies, food for families facing hunger, water and sanitation work and mobile medical clinics. How can I help people in Yemen? Any donation you can give to our appeal is greatly appreciated because it will reach the most vulnerable people in Yemen. You can bring hope and dignity to ordinary people facing a terrible situation.